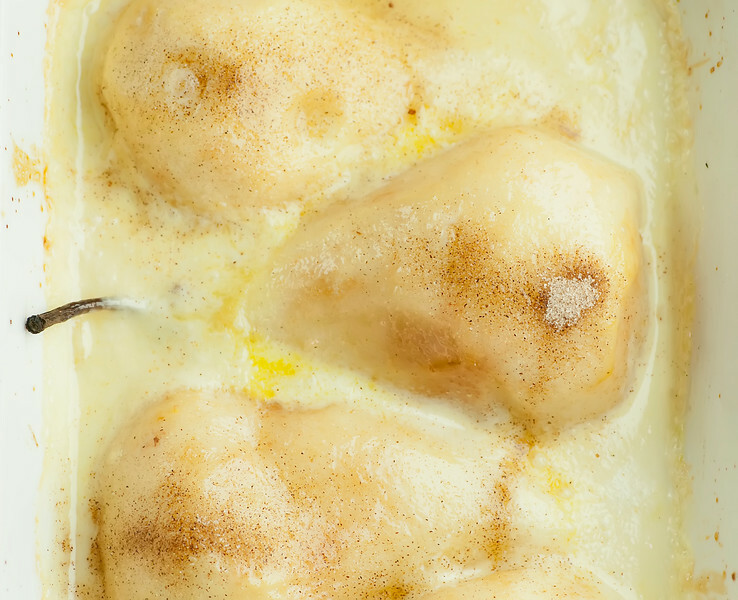 This elegant and easy recipe for pears in vanilla cream sauce bakes up in no time for an elegant, creamy, dreamy dessert full of poached pear flavor. 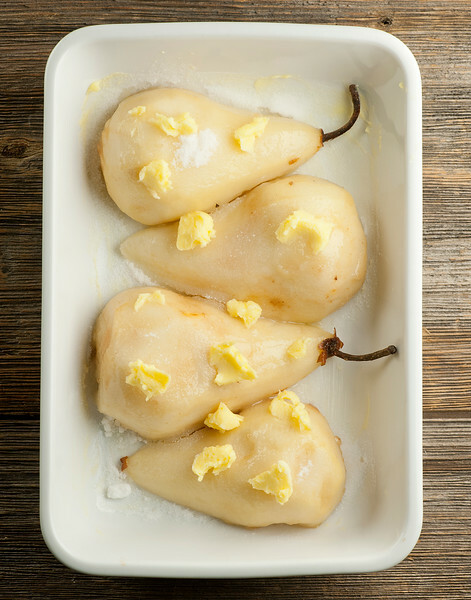 Baked pears never tasted so good! I am a great believer that every once in a while, you should throw your family a total curve ball at dinner time. As in, something that they would never in their wildest dreams have expected to find on their supper plate. In our house, that means, yes, dessert for dinner. 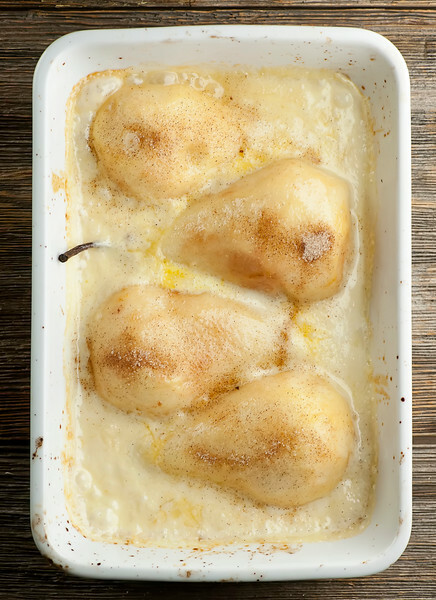 And so one night not so long ago, I served up a warm, creamy, cinnamon-sugary pears in vanilla cream sauce. It’s an easy and elegant dessert that would be the perfect ending to a special occasion dinner party, but when you serve it up on a Tuesday night for supper? It might taste even better! The Southern husband did know that something pear-oriented was coming his way, because earlier in the week he himself took the following pictures of me doing that thing I do. I’m sure I’m an endless source of entertainment for the neighbors. My trusty assistant was guarding the pears throughout the process. He COULD have figured it out from my Twitter feed. If he ever read my Twitter feed. Which he doesn’t, so I knew that was completely safe. And this recipe comes together so incredibly quickly that he didn’t even catch on as I was making it. So it was a total surprise. Win! …and bake them until the are nice and soft. Then pour a mixture of heavy cream and vanilla on top and bake for a few minutes more. Sprinkle them with cinnamon sugar, let them cool for another 15 minutes…and that’s all there is too it! Creamy, sweet pear deliciousness. So pull this recipe out for your next fabulous dinner party…or even better, on an ordinary Tuesday night! Still Hungry? Click on the title of these delicious pear recipes! This elegant and easy pear creme caramel recipe bakes up in no time for an elegant, creamy, dreamy dessert. 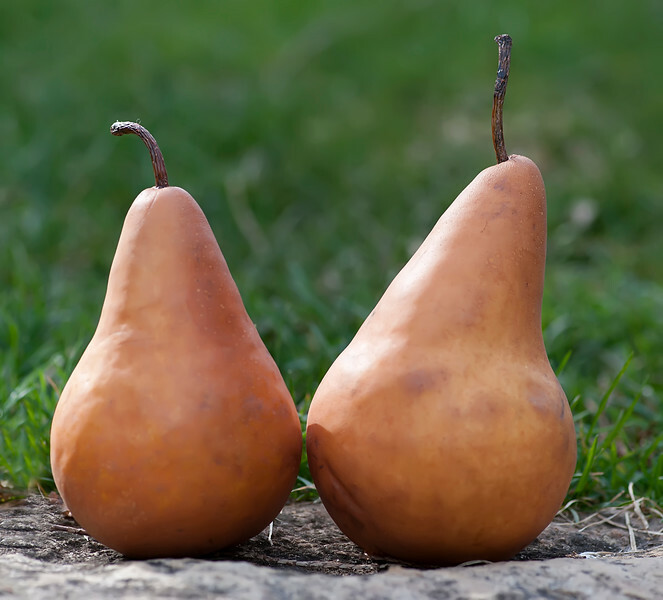 Peel pears and cut them in half length-wise. Scoop out the core and place in a buttered baking pan, cut side down. Sprinkle with sugar and dot with butter. Mix milk and vanilla together and bake for 5 minutes more. Sprinkle with cinnamon sugar, cool for 15 minutes and serve warm. I *know* you’re a photographer among other things but I swear when I saw that I thought it was a painting! High praise in case ya didn’t know. Dinner, dessert, I’d take these pears any way I could get them! They look PERFECT! Thanks Trish! I’m thinking breakfast might be totally reasonable, too. LOVE your site, btw! You are hilarious! 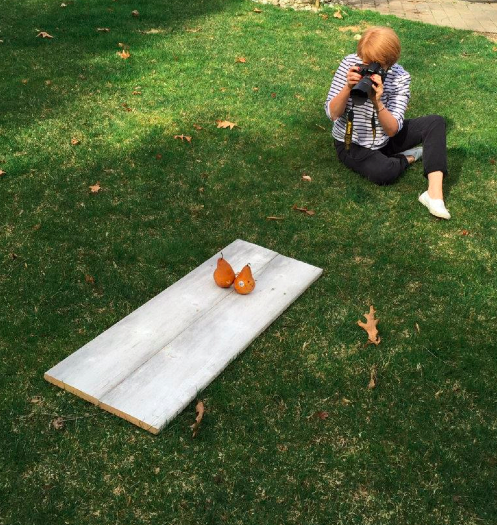 Love those pics of you stomach-down in the grass. 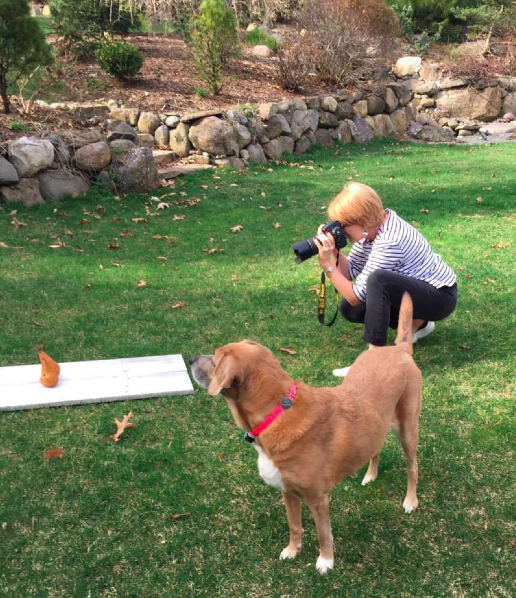 But hey, you gotta get the shot somehow. These look really good! And usually I’m not a fruit for dessert person, but in this case? Yeah! 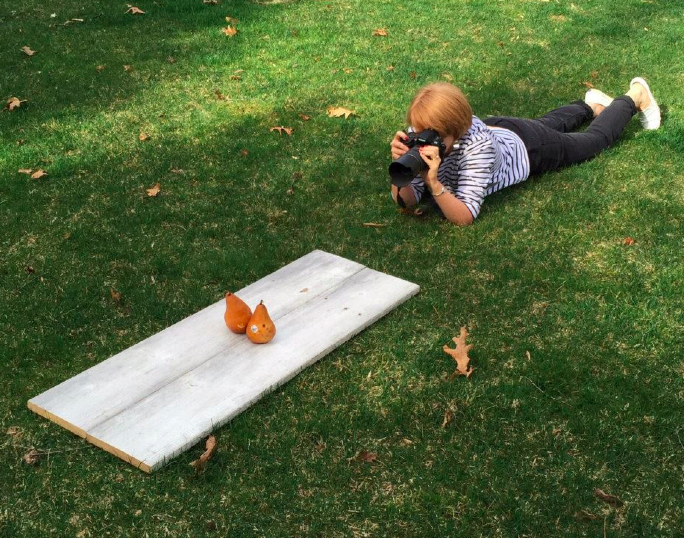 Yep, we gotta do what we gotta do to get the shot! :) And try it for actual dinner! I approve of this dessert for dinner mentality. ANd, I mean, there was fruit in the dish so it’s totally acceptable! I am seriously considering making dessert for dinner a weekly thing. We all need to get more fruit in our lives, after all! One of my absolute favorites. It’s such an elegant dish.